Bayern Munich have reportedly come in with an improved bid of around £30million for the transfer of Chelsea forward Callum Hudson-Odoi. The 18-year-old is a big talent but has struggled for playing time in the Chelsea first-team, leading to plenty of talk about a potential move away. With English youngsters recently making it big in the Bundesliga, Bleacher Report have claimed Hudson-Odoi is very tempted to leave Stamford Bridge and follow in the footsteps of Jadon Sancho and Reiss Nelson. It remains to be seen if Bayern can come up with an offer that Chelsea would accept, but the latest is that they’ve come back to the Blues with an increased bid of £30m, according to the Sun. 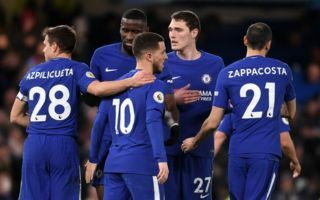 The report adds that this fee could increase with various add-ons, and it’s suggested CFC may find this latest offer hard to turn down due to Hudson-Odoi’s contract situation. The teenager’s current deal expires at the end of next season, making the risk of a free transfer all the greater the longer they wait.